A creature of Philippine underworld mythology-is given a new interpretation in this movie about a group of friends whose camping trip suddenly turns into a nightmare when they find themselves being relentlessly pursued by a couple of ferocious creatures. Apparently, the group has accidentally killed the creatures' offspring when they stumbled on a row of mounds believed to be the breeding ground of the lamanglupa. In the face of adversity, friendships will be tested and various conflicts will unfold, as the group struggles to survive the creatures as well as their personal strife. Kayla is engaged to be married to Harold. She has long been waiting for this ideal wedding. A mysterious vintage gown catches Kyla's attention and gets fixated on it. Unbeknownst to Kyla the wedding gown is evil, passed by a demented bride way back in 1948. Soon, her designer friend -Basti is killed. It's not until an old man appears to Kayla that everything is revealed to her. Will she be able to stop the evil gown in ruining her wedding? Claire, a young doctor-intern at a provincial hospital, encounters a girl who is suspected of carrying a deadly flu virus. But the girl claims that a demonic spirit, not a virus, is residing in her frail body. The girl later kills herself, but not before ensuring that the demon inside her has been transmitted to Claire. Soon, Claire finds herself being haunted by demonic visions. Tita Beth, Claire's aunt and guardian, seeks the help of a young priest, Fr. Ronnie, who happens to be Claire's ex-boyfriend. As the demonic spirit inside her rages on, Claire must confront her tragic past and her ill-fated romance with Fr. Ronnie. But will the priest succeed in overpowering the evil spirit that threatens to take over Claire? Shake, Rattle & Roll 11 is a 2009 Filipino supernatural horror film in three acts from Regal Films. 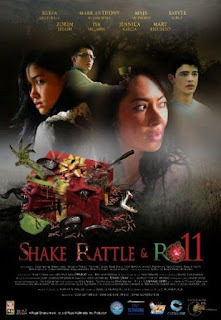 It is the eleventh installment of the Shake, Rattle & Roll film series. It was also distributed by the Regal Entertainment, Inc. and Regal Multimedia, Inc. It was an official entry in the 2009 Metro Manila Film Festival. The film received the Festival Award for the Best Make-up.